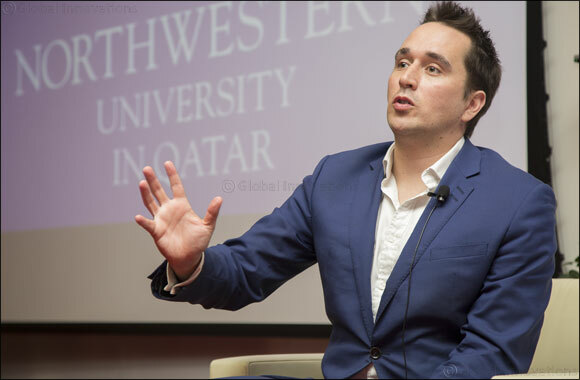 Doha, Qatar – November 16, 2016 – Drawing from his experience with former UK Prime Minister David Cameron’s election campaign and the recent Brexit referendum, Giles Kenningham, spoke to Northwestern University in Qatar’s (NU-Q) students, faculty, and staff in an interactive session discussing key political communications challenges and opportunities. Kenningham’s career as a journalist started as a producer for ITV News. From 2012 to 2015, he served as director of communications for the UK’s Conservative Party. His interest in local media and local government was notable when he was a special advisor to the UK’s Secretary of State for Communities and Local Government Eric Pickles. He has also worked closely with the famed political communication expert Sir Lynton Crosby. “Kenningham’s journey from a journalist to director of political press is an example of the prospects and opportunities that await our students and alumni, who enjoy a combined passion for journalism with politics and public affairs,” said Everette E. Dennis, dean and CEO. Although behind the scenes, Kenningham’s journey at 10 Downing Street was very hands-on, keeping him on the edge with the rapid growth of media platforms, increase in the number of influencers, and unprecedented viral distractions online. “His main message to us is to underscore the importance of making fast-paced, informed decisions to transform complex issues into simple messages directed at the general public – such skills define political campaigns and shape people’s views on important aspects,” Dennis added. At NU-Q, Kenningham discussed the implications of political press on voting results, and the challenges that politicians encounter in developing strong arguments and messages throughout their campaigns. “With the shift toward social media, and other online platforms such as blogs and forums, the cycle of campaign outcomes has become much less predictable. More disruptions and unforeseen trends are expected - this explains why, with the outcome of the Brexit referendum and the recent U.S. elections, most of the pollsters and pundits were inaccurate,” said Kenningham. As a press officer for the Tories beginning in 2006, he was known for making politics “more relevant to people locally with less Westminster bias” and fostering the interplay between national and local media. A series of questions from the audience tackled various issues surrounding political communications, including the rise of social media, which has given power to users who may share inaccurate information, as well as the shift of focus to stories not as relevant as the main message. “Politicians are often overtaken by the ‘media storm,’ which makes it very difficult for them to get a grasp on the bigger picture. My role, along with the rest of my team, was to make decisions by taking a step backward, be one step removed from the chaos of political press, and analyze our next steps, making sure we are constantly aligned with our overall communications strategy,” said Kenningham. As an adviser to the UK Prime Minister, he played a key role in the 2015 general election as well as the Brexit campaign. He is currently a strategic communication consultant and was recently named a Member of the British Empire (MBE) by H.M. Queen Elizabeth II for his service to public affairs.